These crepe paper eggs are super easy to make and the best part is, you can keep them up after Easter as part of your spring décor. You can use cheap plastic eggs or these foam eggs that I happened to have on hand. Use Mod Podge or some sort of decoupage adhesive and layer strips of crepe paper on your eggs. Once the crepe paper is almost dry, press down any little bits or edges of the crepe paper that are not flat. This will give your egg a nice egg shape. 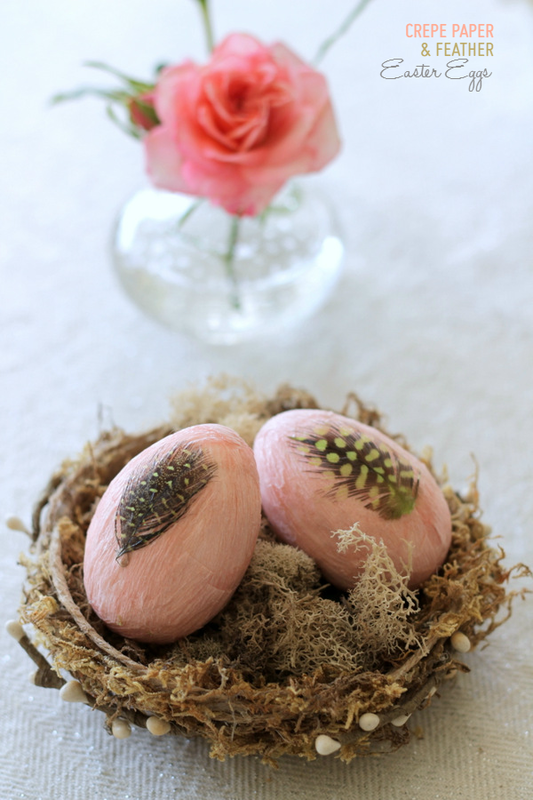 When you egg is completely dry, use small feathers, leaves or pressed flowers to add a little embellishment. Just Mod Podge them onto the egg. Pop your eggs into a pretty nest for a natural look. Or simply add them to a bowl with some real or artificial flowers. I’m so relieved I managed to sneak in a last minute egg project. Here are some of the eggs I’ve shared in the past years. Thanks for your sweet comment and letting me know about Chrome. How strange... now hmmm how to fix it. Uggh. Adorable and elegant! I love all your creations! Beautiful little rose! Hi! I just stopped by from Link Party Palooza. These eggs are gorgeous! I've never seen anything like them. So beautiful. I love the color contrast.